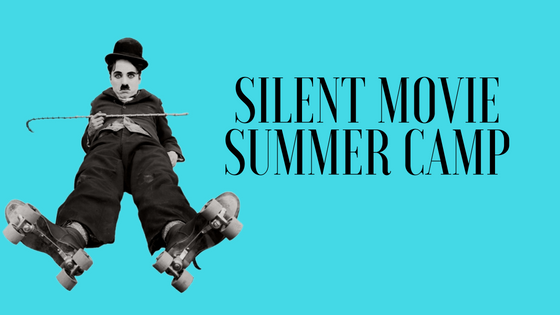 Find out all about the Silent Movie Summer Camps from Tori Lee & JoAnne Neary! Tori Lee is a drama facilitator for young people, an actor and playwright. I’m really looking forward to the Summer Camps. Working with children for years, they have never ceased to delight me with the fabulous ideas they come up with or the performances they give when they are having fun with a group of their peers. I haven’t laughed as much as when they get their comedic heads on and it is all great belly laugh stuff. The Silent Movie Camp is really a camp for all those young actors, scriptwriters, musicians, designers, storytellers, storyboard artists and those who might want to look at life through the lens. Whereas they won’t be editing the film this time around it is certainly something we could look to for the future. I want them to take ownership of the project, their ideas which they can work together for an entertaining outcome. We will have an introduction to the medium and look specifically at how in these films they tell the story with their whole body, they are not relying on words to convey the emotion or sentiments. Sometimes we get hung up on words, how we shall deliver them, that we forget it is just part of the performance. The musical score over the top is another area where they can see the power of a soundtrack…see how the audience is already being prepared for a certain emotional response to what is being visually seen. That is why we would encourage any musicians among the participants to come along and give it a go. We will show them the likes of Charlie Chaplin, of course, and Buster Keaton for the pure glee of the silent movie. We will of course look at other artists, from the earlier more primitive films to the later styles. Looking too at the glorious Georges Méliès . The only thing I won’t be doing is encouraging them to re-enact the stunts of Keaton, Chaplin or Harry Lloyd …I don’t think we have the insurance for that! A big love of mine is shadow work. To me magic abounds when a world emerges with a simple piece of cardboard cut into a shape and a sheet and some lighting. I’m a huge fan of Lotte Reiniger the German film maker and animator. She really was a pioneer of the silhouette animated films from the 1920’s and up. They are such a delight. I’d urge everyone to look her work up. In terms of shadow puppets, when I see a shy child take a cardboard puppet and go behind that screen where he/she is no longer visible and suddenly become this great storyteller is just wonderful to behold. There is a place for all sorts of characters in these camps, I look forward to meeting them. JoAnne is a creative soul who can’t imagine life without music, she likes to see the positive. Film is one of the most wonderful Art forms, even the people who are “not into Art” still love a good film . As a child I was never brought to an Art gallery, but I was brought to the cinema. We went to the Savoy cinema in Sligo to discover that Darth Vader was actually Luke’s father (sorry for the spoiler !) The Empire Strikes back had it all for me, fantastical creatures and scenes, that amazing score and my first feminist icon – Princess Leia. The memory of that will remain fastened in my memory bank forever because it was magical. And imagine that all that magic was brought to us without CGI. We want to recreate the magic of film, particularly silent films in our Summer Camp, it will be great fun. We hope to inspire as much exaggerated behaviour and facial expressions as possible. Don’t worry we will ask all participants to keep the eye rolling for summer camp but think Charlie Chaplin’s walk and the heart clenching in Metropolis! Our format for the week will enable the children to lead us with their imaginations. They will write the script, create the storyboards and the scenes, act in, direct and ultimately contribute to all aspects of the production. It’s a brilliant way to encourage trust in your teammates and get everyone working together to produce their very own masterpiece. We’ll finish up the week with a fabulous red-carpet premier of our very own Silent Movie production. I can’t wait !!! Running for 8 to 12 year olds from the 16-20 July from 10am to 2pm. Running for 12-16 years olds from the 23-27 July. €60 per child. Running in The Glens Centre, New Line, Manorhamilton, Co. Leitrim. Phone (071) 9855833 for more information.